World War Two is over, but Airboys work isnt done! 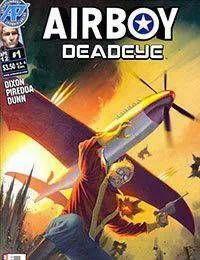 Davy Nelson, the teenaged fighting ace known to the world as Airboy, returns to the skies in this brand new limited series!<br />Using his miraculous plane, Birdy, Davy finds and defeats a Japanese air ace holding out on a remote island. When he visits the man in postwar Tokyo, Airboy uncovers a conspiracy that could plunge Japan into the maelstrom of war once again!